1. Useful information about pararosaniline and its methylated analogs (Basic Fuchsin) is available in the 9th edition of Conn's Biological Stains (69). In particular, refer to the chapter on triaminotriphenylmethane dyes (Basic Fuchsins and Rosanilins) pp. 259-266. Also, see Table 19.1—Nomenclature and Synonyms of Stains and Chromogenic Reagents Arranged in Order of Color Index Numbers; Table 19.5—Solubility Data; and Table 19.9—Solubilities of Certain Certified Commercial Stains. 2. There is substantial literature on the use of different dye lots in the traditional method of dissolving Basic Fuchsin in boiling water, then adding the metabisulfite (49,52,59,60,70). Storage of this reaction mixture in the dark may vary from as short a period as 3-4 h up to 30 d, before decolorizing with activated charcoal (2,16,70). In our experience, storage for 60-72 h in the dark at room temperature is adequate for completion of the reaction that produces leucofuchsin sulfurous acid for Feulgen staining. Longer periods of 96-144 h yielded no increase in the staining intensity of chicken blood cell nuclei (Rasch, unpublished data). 3. Schiff's reagents often show a white, polymorphous precipitate after varying periods of storage in the cold. Formation of the precipitate is less common if the reagent is stored in small bottles, filled to the top to minimize air space and loss of SO2 from the solution (52,58-60). Increasing the acid content to 0.2 N for 1 g of dye or lowering the dye content to 0.5 g in 0.15 N also tends to prevent formation of the white precipitate with certain dye lots of Basic Fuchsin (60), but may reduce staining intensity due to continuing acid hydrolysis of the DNA in the Schiff's reagent itself. 4. Not all Basic Fuchsins make satisfactory Schiff's reagents. Solutions made from the same batch of the dye may differ considerably in performance, possibly because of conditions and age of the dye lot. Some dye lots are unsatisfactory for staining DNA because the Schiff's reagents prepared from them retain a faint yellow to a dark yellow to yellow to an amber discoloration, despite multiple treatments with decolorizing activated charcoal. Several dye lots of certified Basic Fuchsin for which three to four repeated charcoal treatments did not remove residual discoloration of the reagent include DcFp 8 (yellow), DcFb 14 (dark amber), DcFr 17 (dark yellow), and ACF 37 (medium yellow). 5. Most authors consider that a Schiff's reagent to be used in the Feulgen reaction for DNA has a useful shelf life of some 4-6 mo when stored tightly sealed in a refrigerator. Although unopened bottles of reagent can stain very well even after storage for a year, for quantitative cytophototometry it is prudent to evaluate new batches of Schiff's reagent by doing a trial run with both chicken and trout blood smears before processing a set of high-value Drosophila preparations. Evaluating the staining behavior of a Schiff's reagent and determining the optimum duration and temperature for the acid hydrolysis step are critical for reliable and reproducible C-value estimates. 6. To minimize the loss of apurinic acid fragments during the acid hydrolysis of the Feulgen reaction (7,44,49) some workers (40,46,50,61) have hydrolyzed their preparations in 4 N HCl made with polyethylene glycol (PEG) (molecular weight 8000 (e.g., from Sigma-Aldrich, cat. no. 2139), using 15 g PEG per 50 mL of 4 N HCl) for 1 h at 28°C. This is followed immediately by 1 h of Feulgen staining (Schiff's reagent from Sigma-Aldrich) and then given multiple rinses in sulfite water, washed in deionized water, and dehydration in graded alcohols to xylenes for mounting in oil or resin under glass. 7. A few disposable, polypropylene micropipet tips (200 |L capacity) plus several gum rubber pipet bulbs make economical and effective tools for adding or withdrawing small amounts of fixative or other liquid reagents in the immediate vicinity of tissue fragments on a subbed slide. These items are readily available from the vendors listed in Table 3 (e.g., Fisher Scientific Co., cat. no. 21-197-8E 00 for 200-|L-capacity polypropylene, disposable Redi-Tip micropipet tips and cat. no. 14-065A for 1-mL-capacity gum rubber bulbs). Because of the very small aperture at the tip, the plastic's hydrophobic properties and the fingertip control that a soft rubber bulb affords over the rate of flow at the pipet tip, this homemade micropipet works quite well to facilitate changing solutions without touching tissue specimens. In addition to using micropipets for the multiple protocol steps required for Feulgen staining en bloc, we use 1.5-mL-capacity polystyrene "Autoanalyzer" cups (e.g., cat. no. 73.641, color: neutral, Sarstedt, Newton, NC) to hold tissue during the staining process. These cups, or any other short, transparent, plastic vials that have conical bottoms and are free-standing should have "snap off' caps to minimize the loss of SO2 during the course of the Feulgen reaction and the changing of reagents sequentially with the micropipets. 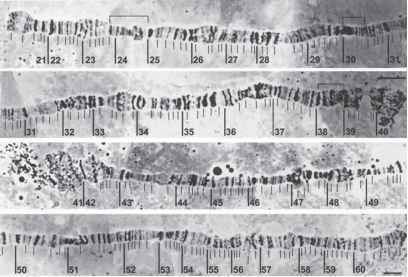 Several different specimens can be processed at the same time through the acid hydrolysis and all of the subsequent steps of the Feulgen staining protocol. The ease of changing solutions and the swirling of tissue fragments upon the addition of each solution in sequence allow both an adequate reagent volume : tissue ratio and sufficient agitation of the specimen to achieve excellent staining for about a dozen sets of different tissue samples simultaneously. Costar No. 3512 for 12 wells per plate or Fisher cat. no. 07-260-740, Corning Costar No. 3527 for 24 wells per plate) and can be used with micropette tips to house different individual tissue specimens (e.g., single ovarioles). However, a glass plate, plastic top, or a thin film of plastic (such as Saran Wrap from a supermarket) should be placed over the tray to prevent dissipation of SO2 from the Schiff's reagent during the 2-h period of the reaction. The plastic trays can be used with an inverted microscope or with a conventional dissecting microscope to monitor the course of the reaction. A particular advantage of the plastic micropipet tips and the small plastic vials (or wells in a plastic tray) is their adversity to water, which minimizes the hazard of tissues adhering to pipet tips or container walls, as so often happens when using glass surfaces. A customized "tool" kit of micropipets of different holding capacities (20-200 |L) can be easily put together for the particular volumes needed with a given staining protocol. The base of some micropipet tips fit snugly when inserted into the holding rim of a 1 mL rubber bulb. If not, apply a thin film of glycerine around the rim of the pipet base to assure a good fit and adequate suction. Bulbs and pipet tips can be cleaned and recycled for months. Dispo micropipet tips are usually sold in lots of 500-1000 per package. An alternative acquisition plan, perhaps, would be to seek out a colleague in molecular biology who would be willing to make an indefinite loan of a dozen or more polypropylene micropipet tips in return for a good cup of coffee or a cold can of soda. 8. Coated slides are prone to scratches on the face or back of adjacent slides as they are jostled in moving in and out of Coplin jars for the various steps of the Feulgen reaction. Be careful as you move each slide so that rips or tears of the film do not detach tissue fragments from neighboring slides. 9. Almost all of the Parlodion film on a coated slide can be removed after completing the Feulgen reaction by dehydrating coated and stained slides from deionized water through a graded series of ethanols up to absolute ethanol. After three 5-min changes in absolute ethanol, the film is essentially gone and the slide can be cleared in several changes of xylenes before mounting in an appropriate refractive index liquid for cytophotometry. 10. An analogy comes to mind: the chance of shooting a fish in a barrel (photons absorbed) is vastly different when there is only 1 fish (very high transmittance) rather than 50 fish (very low transmittance) available as targets in the same size barrel. 11. To eliminate fluctuations in line current and "noise" in the system, plug the microscope source light and the computer into a voltage regulator (Sola Microcomputer Regulator [MCR], Elk Grove Village, IL). If problems arise with DC power supplies for halogen lamps, such as those used in Vickers M85 microdensitom-eters, the TENMA model no. 72-6625 regulated 13.8 VDC power supply (20A continuous, 25A surge current capacity) is both useful and economical. It is available from MCM Electronics (www.mcminone.com) and can be fine tuned to deliver somewhat less voltage than regularly used for a 12V lamp (e.g., 11.75V) to obtain a ripple of less than 0.8 mV at the bulb base which significantly pro longs the life of the lamp. Simple surge protectors and "line conditioners" are inadequate for the job to be done in modulating voltage shifts during routine operation of the microdensitometer. 12. So-called "body cushions" to eliminate building vibrations are polymer pads, available in several sizes that are mounted on steel plates for strength and weight, but literally soft-cushion a microscope base to make it essentially vibration-free. This feature also recommends their use for image analysis and photomicroscopy. The pads are both suitable and economical for damping building vibrations and are available in various sizes and in four degrees of polymer hardness from Dynamics, Inc. (Allentown, PA). 13. Although the 100x oil immersion lenses for most microscopes have a refractive index (nD) of 1.515, as do most glass slides and cover slips, and require the use of oil with a nD of 1.515, some lenses such as those for the Vickers M85 instrument's 40x high dry lens and the 100x oil immersion objective have a nD = 1.524. It is important to use a matching refractive oil of nD = 1.524 for immersing both the objective lens and the top lens of the condenser, if double immersion is used to enhance resolution and to minimize distortion of light as a result of scatter. 14. Sets and single 4-oz bottles of refractive index liquids are available from R. P. Cargille Laboratories, Inc. (Cedar Grove, NJ). 15. Convenient blood cell standards may include domestic chicken, RBC 2.5 pg DNA per nucleus; molly fish RBC, 1.6 pg DNA/nucleus; carp, 3.4 pg DNA/nucleus; rainbow trout RBC, 5.1-5.2 pg DNA/nucleus; Xenopus laevis, 6.3 pg DNA/ nucleus and human lymphocytes 7.0 pg DNA per nucleus. It is very easy to work with a small droplet of blood to put a thin film of standard cells on the bottom half of a slide, leaving the top half free for the addition of an "unknown" cell sample (see ref. 12 for additional suggestions). 16. See Hardie et al. (12) for directions on making blood smears by "pulling" rather than "pushing" a drop of blood along the surface of a glass slide to minimize cell damage. 17. A convenient and readily available listing of genome sizes for many vertebrate and/or invertebrate species is the Animal Genome Size Database imitated and maintained by T.R. Gregory Online at www.genomesize.com. 18. The England Field Finder gridded slide is available from McCrone Microscopes and Accessories, Westmount IL; cat. no. 313 (www.mccrone.com). Although the Lovins Field Finder is no longer manufactured, it might be worth inquiring about its availability as a used item from microscope dealers and microscope repair shops.